When most travelers think of Italy, they tend to think of Rome, Florence, Venice, and maybe the Amalfi Coast. These are all wonderful destinations with so much history, art, culture, and a gourmet’s delight, but many travelers overlook the beauty and stately elegance of the Lakes District of Italy. 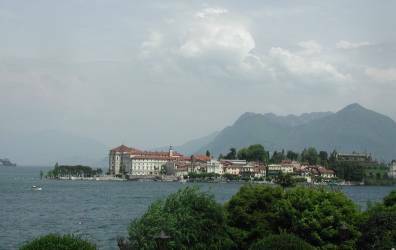 Lake Maggiore with the Borromean Islands, where the lovely town of Stresa is located. 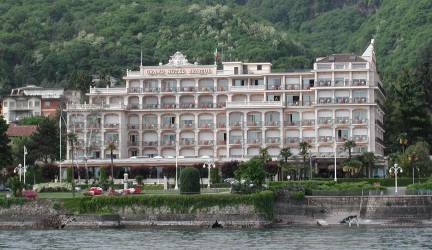 Lake Como with Como, Bellagio, Cernobbio, 5 star palatial Grand Hotels and legendary gardens. The Lakes District is Italy’s best-kept secret, and a “must-see” for serious travelers. We were fortunate recently to travel to the beautiful Lakes District of Northern Italy. In an effort to bolster travel agent awareness of this wonderful location, Donna Franca Tours ww.donnafranca.com of Boston offered travel agents two 7 day “5 Star” FAMs to the Lakes District of Italy during the month of May. Our trip was truly marvelous. The trip included round-trip airfare on Alitalia, from Boston, New York or Newark directly to Milan. We flew from Newark, and after a pleasant 7-hour over-night flight, we landed in Milan and were met by our superb guide Simone and gracious driver Rosario. There were 16 travel agents, spouses, and companions in our group arriving from all over the country. The next few days were spent in Stresa in the foothills of the Alps on Lake Maggiore. 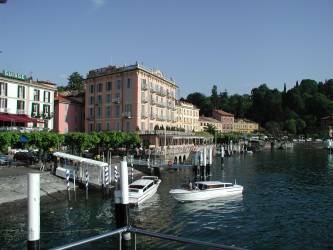 It is a beautiful lake side city with history dating back hundreds of years, palatial hotels facing the beautiful Borromean Islands, boat rides on the lake, and many magnificent gardens. May was the perfect time of the year to see their many blooming flowers and tree. We stayed at the 5-star Hotel Bristol www.grandhotelbristol.com that was very lovely. Our guide took us to the very quaint and romantic Villa Aminta overlooking lake Maggiore for lunch. The tastefully decorated rooms with superb views, the dining rooms, and grounds were spectacular. We enjoyed an exquisite multi-course lunch that included lasagna that was to "die for". We spent a leisurely afternoon strolling around the town and along the waterfront. Our evening meal was arranged at the very beautiful Regina Palace Hotel. Our dining experience was a culinary delight with multiple courses, wonderful wine, and impeccable service. The following day included a short ferryboat ride to Isola Bella with a tour of the magnificent palace and gardens. Lunch at the Elvezia Restaurant on Isola Bella was served on a terrace overlooking the Lake with a friendly atmosphere, great service and superb cooking. 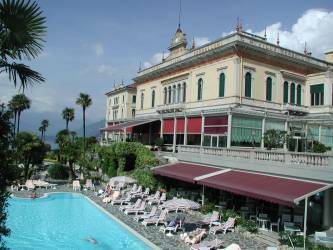 Next we stayed at the 5-star Grand Hotel Villa Serbelloni www.villaserbelloni.it, a renowned deluxe resort property, located in the town of Bellagio on Lake Como. The hotel was elegant and all of the staff and service was marvelous. All of our lunches and dinners were served on the very sophisticated terrace restaurant with a breathtaking view of Lake Como. The food and service was definitely award winning. 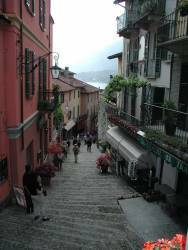 Bellagio is in a beautiful location, with its many shops and stair stepped side streets to wander around and visit. We walked to the Villa Belvedere for an afternoon aperitif, experiencing friendly and accommodating staff and a tour of the property. Located a short distance from the town, it has a peaceful, serene feel and atmosphere. We would definitely recommend this hotel to future travelers. The following day included a trip to Lake Lugano in Switzerland. We traveled along the narrow winding road along the shoreline of Lake Como. This magnificent, picturesque lake with many brightly colored villages and lovely churches seemed to be glowing in the radiant morning sun. Lake Lugano with its splendid scenery, mountains and views was also breathtaking. The city itself was a shopper’s paradise, but we opted for a lake front stroll and enjoyed a local lunch in a small café. 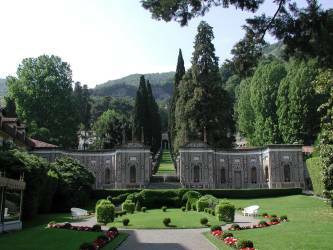 On our return to Bellagio, we visited another 5 star resort called Villa D’Este. The Villa with its lush grounds, and amenities, is ideally situated with a spectacular view. On our final day, Simone took us on a walking tour from our hotel to Villa Melzi. Walking through the romantic and lush gardens, you could picture yourself back in the 17th century, especially near the stately villa. The house was not open to the public but standing on its grand staircase overlooking the lake was spectacular. 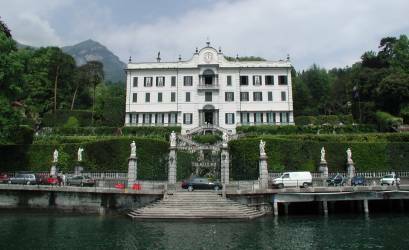 We then took a ferry across the lake to the town of Tremezzo to another stately home known as Villa Carlotta. The villa was lovely, as were the famous English Garden with 14 acres of roughly 500 species of plants and flowers. Dinner back at our hotel on our last evening was superb as always, where we thanked our hosts, Simone and Rosario, along with the wonderful, attentive and superior staff of the Grand Hotel Serbelloni. Even though, we have traveled all over the world, to marvelous destinations that are absolutely fabulous and beautiful, this trip was one we will always hold special in our hearts. Maybe it was the elegance of the accommodations, the superb food, and impeccable service or maybe it was just the welcoming and gracious Italian people and romantic culture that made this trip so memorable. Whatever the reason, it should definitely be on the top of your list for places to visit.